The QuickFish3 offers 34 square feet of fishable area and enough room for up to 3 people. With only a 60 second set-up, this pop-up shelter is composed of sturdy hubs, strong poles, YKK zippers, and self-tapping ice anchors. In addition the QuickFish3 features removable windows, mesh storage pockets, and two doors for easy entry and exit. 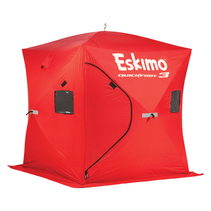 With a strong, durable shelter and quick, easy setup, the QuickFish allows you more time for ice fishing with your friends and family. Set-Up Size: 70" x 70x"
Elbow Room: 90" x 90"
Collapsed Size: 52" x 8.5" x 8.5"
* All sales are subject to prior sale.